Rescue the lamias' children from the savage Wood Elves. I decided to ask Tzik'nith for help getting into the tower. Before she shows me the secret, however, she wants me to help her against the Wood Elves. Talk to Queen Fah'jik at the central camp. Talk to Tzik'nith at the Ruined Passage. Take the Light of Meridia. Talk to King Laloriaran Dynar. 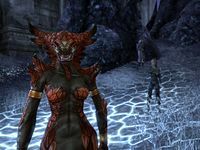 Tzik'nith informs you that the Shadow Walkers are holding the Lamia eggs as hostage in their camp and asks you to get them back. For the optional objective, talk to Faraniel before you leave and she will request you not kill any of her brethren. When asked how, she notes that the camps are poorly defended and sneaking in should be easy. Go to the camp and retrieve the eggs. Tzik'nith will meet you just outside the camp. She tells you that the Queen's eggs are being kept on the floating rock above the camp where the Shadow Walkers' elders live. In order to get there, a key is needed; the two shards of the key are protected by guardians nearby. Asking Tzik'nith for advice on how to get past the guardans without violence will earn a derisive remark; if you have the Persuasion perk, she will note that touching a wisp of light would probably allow you to get past them undected. Touch the nearby wisp of light to turn the guardians passive or simply kill them, follow the quest marker to Queen Fah'jik, and follow her through the portal. You will find the Queen and her Lamia standing over the corspes of the elders. Fah'jik is unapologetic, claiming that the elders would not listen to reason and without their leadership, the remaining Shadow Walkers will crumble. Return to Tzik'nith, slip through the passage, and talk to the projection of King Laloriaran Dynar to complete the quest. In ancient Greek mythology Lamia was a woman or female monster that captured human babies. Here the lamia babies are the victims. Sneak into the camps where the lamia eggs are held. Touch a Wisp of Light before going after the key shards; this will make the Guardians passive towards you. Before Tzik'nith will tell me the secret to entering the tower, she wants me to recover the stolen lamia eggs from the Wood Elves. I rescued the stolen lamia eggs from the Wood Elf camp. Now I should find Tzik'nith and return the eggs to her. Tzik'nith wants me to acquire the two shards that make up the key to the portal. With it, we can access the portal to the council of elders' floating platform, where they hold the lamia queen's eggs. I acquired the two shards and they joined to become a single key. Now I need to make my way to the camp at the center of the forest and meet with the lamias. Queen Fah'jik wants me to use the shard key to open the portal to the council platform. She claims I'll have the help of the lamias when I go to recover her eggs from the Wood Elf elders. I stepped through the portal. It looks like the lamias have already dealt with the Wood Elves' council of elders. I should speak to the lamia queen and find out what happened. The lamia queen sent Tzik'nith ahead to open a passage to the tower. I should go northwest and meet up with her. Tzik'nith assures me that the ruined passage leads to the mysterious tower. I should enter the passage and see if I can find the source of the cries for help. A projection of King Laloriaran Dynar greeted me as I emerged from the ruined passage. He wants me to collect the Light of Meridia, which he claims can be used to set him free. Finishes quest I collected the Light of Meridia. Now I should speak to the projection of the Ayleid King and see what I should do next. This page was last modified on 25 January 2019, at 05:44.